Ocean Boulevard condo towers with potential views of a baseball stadium in Downtown Long Beach include the International Tower, the Harbor Place Tower and the Aqua. Courtesy photo. Feeling lucky, Shifty? The odds are long, but here’s a big-payoff shot for you: Bet your mortgage on another mortgage by taking a flyer on the possibility of the Angels coming to Long Beach. All you’ve gotta do is you put your paid-for East Long Beach house up for sale and put your $600,000 profit on a condominium on Ocean Boulevard and pray to the fickle gamblin’ gods that the new waterfront stadium is built in such a way that you’ll have a clear view of the field. Bonanza! That’s the general feeling, that buying a field-view condo is real-estate gold. Look what you get: virtual season tickets with private balcony seats. But that’s not always the case. While an ocean view is always a big plus, there’s still a lot of uncertainty about what a view of a baseball diamond is worth. For one thing, if you’re going to take a shot at winning the ballyard-view lottery, you’ll want to know where, exactly, will the best vantage points be? We’ve had a sheaf of Public Records Act documents sitting on the mayor’s desk for weeks now, in which we’ve politely requested the release of artist renderings of the new stadium, but so far it’s been like trying to score the recipe for Coca-Cola. Our city officials are as transparent as a piñata blindfold, so I can’t give you any serious tips on where the best sight-lines will be, but if I was a gambling man like you are, I’d be tempted to go all in on one of the condo high rises along Ocean Boulevard—the Aqua, the Harbor Place Tower, the International Tower—with good views, currently, of the Long Beach Arena’s elephant lot, because if you can see that lot, chances are fairly good you’ll be able to watch the Angels lose from your veranda while eating your own hot dogs and drinking whatever beer you prefer while simultaneously watching the Zillow estimate of your home soar into the seven figures. Or, then, on the other hand, maybe not. It’s a risky gamble, though if you lose you’re merely stuck with an ocean view. Turns out views of a baseball diamond, such as those enjoyed by some condo owners around the San Diego Padres’ Petco Park, is a lot like a house with a swimming pool: Some people want one, others see it as a headache. 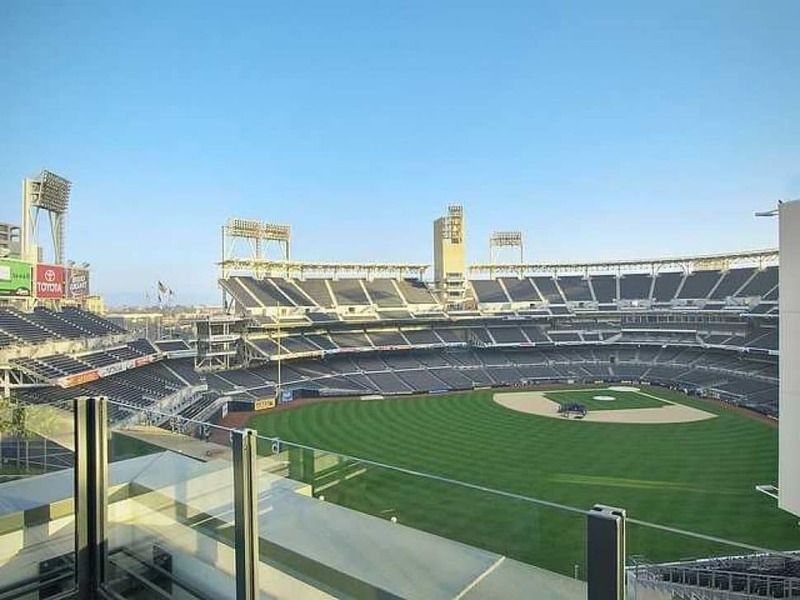 The value of a condo with a field view “depends on how much into baseball the buyer is,” says Robert Gmur, a real estate agent with Dannecker & Associates, which sells condominiums and other properties in San Diego. But, he also reckons a view of the field will raise the price of a condo unit by $100,000, so it’s a bit foolish to spend that much extra if you’re not into baseball. 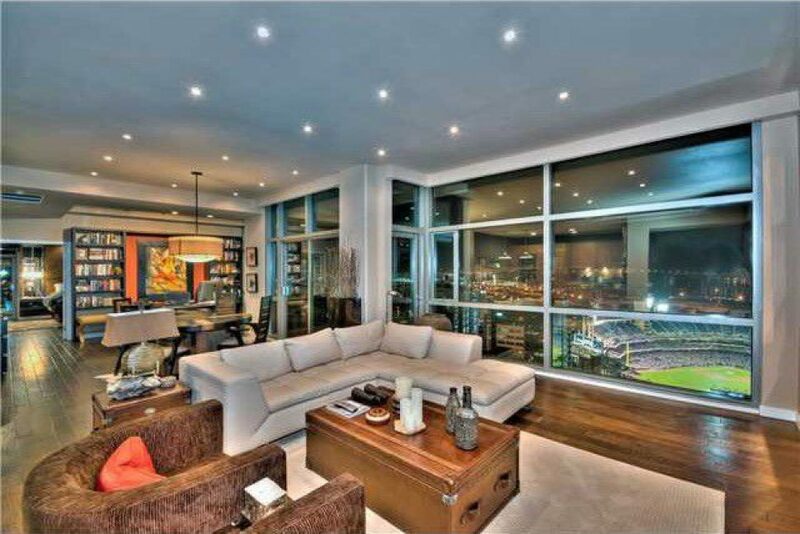 A condo at San Diego’s The Mark overlooks Petco Park. Courtesy photo. Gmur’s boss, Chad Dannecker, said he has been disappointed by Petco’s effect on prices. “The stadium is beautiful, they really nailed it with the stadium, but, surprisingly it hasn’t had a tremendous impact on prices,” he said. The Petco-area high-rises like The Legend, The Mark, ICON and others are fantastic buildings that are suffering, says Dannecker, because of the lack of jobs in San Diego. “It’s a beautiful city, but the one thing we lack in Downtown San Diego is jobs,” he said. A spectacular view of Petco Stadium’s field from a balcony in The Legend in Downtown San Diego. Courtesy photo. The big condo draw in Downtown Long Beach is the ocean views, and Gmur likens stadium sight-lines to views of the Pacific in terms of dollars you can tack on to the price of a residence. But, while a view of the eternal Pacific has few if any drawbacks, there are downsides for many property owners when it comes to suddenly being near a sports stadium. A stadium is noisier, it brings horrific traffic and, in fact, many residents in the Ocean Boulevard towers, including owners who treasure their ocean views, are very much against the Angels landing in Long Beach. What would Jim Goodin, Aqua resident and president of the Ocean Residents Community Association do if the stadium landed in Downtown Long Beach? “Well, I’d have to move! Of course!” he hollered, as if a low-security prison for crack-addicted serial killers in the Aqua’s recreation room was being considered. The residents association, in fact, has been battling boulevard racket for years. “In our March meeting there wasn’t one person in favor of building a stadium,” he said. “The only thing we don’t disagree with is the Grand Prix, because it was already here for a long time.” If only residents near the airport thought that way. Realtor Mike Dunfee, who has sold more than 100 units in the two Aqua buildings, has had to walk the line between future profits and pleasing his current clients. But good sight-lines of the field would be crucial to a big increase in value and desirability. Dunfee also agrees that while a stadium might chase current residents off to quieter areas, their condos would quickly fill with people who are “into baseball.” And that would change everything, says Dunfee.